Great savate tournament in Marseilles. Thailand and Japan were also present. Strong fights in women categories. There is no mercy when your opponent serves you with full strength kick of his hardened - sports shoe. These kicks are dangerous especially for the targets like plexus, liver and head. KO (circle kick) Issa Barhoumi (Tunisia) against MONSEUR Gerard (Belgium). After 3 counting punches Arsen won with his typical Muay-Savate tecnique. In Marseilles - sailors 200 years ago kicked with additional hand-grip on the floor (like capoeira) and on the wall or fence. Interesting video filmed for Human Weapons documentary. The popularity of MMA (Mixed Martial Arts) or caged matches are gaining popularity with very young children. The State of Missouri is one of the only USA states which permits public events to take place at this time. Children as young as 6 years old train for the events. Full contact is not allowed until the age of 18. K-1 Rules Tournament in Hungary 2007 in town of Debrecen. Ferencz József - savate fighter decided to step in ring with K1 stars, and as you see for the first time he was brilliant. Congratulations to Hungarian savate. Great job. French Cup 2008 - Quimper 22&23th March 2008. In Italy all savate teacheras and fighters joined FIKB (Federazione Italiana Kickboxing - Italian kickboxing federation). But some of them (not part of FIKB but members of CSEN - (Centro Sportivo Educativo Nazionale - National center for sport education www.csen.it)) few days ago were invited to Kranjska Gora (Slovenia) seminar - 1st European stage Martial art CSEN (28-30th March). 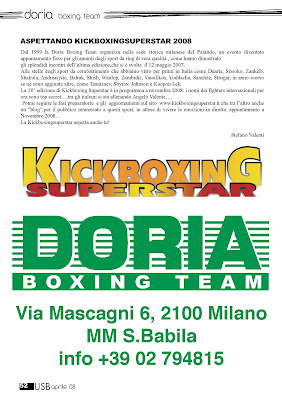 And Daniele Colleto (ex IAKSA) should present Kickboxing and Savate in the name of CSEN (member of an Italian Olympic Comitte - CONI) . Denis Porcic - Slovenian rapper also demonstrated some ju-jitsu techniques. GB8 in Marseilles. Christian N'Ka (smaller fracture of shinebone)lost his match against Czech Roman Kleibl. Christophe Canal (Ring Marseillais) won Laurent Long (Provence BF) by points. Christophe Hourtal (Savate Club Valentine) won Nicolas Atmani (Punch Université) by points. Benoit Bouhris (Punch Université) won Herbert Danois (US BF Melun) by points. Roman Kleibl (Punch Impact du Golfe) won Christian N’Ka (Team Borg) surrender in 3rd round. Cédric Castagna (Team Borg) won Ha Van Yoan (Savate Club La Valentine) by points. Anthony Frémont (Corsaire Boxing) won Stéphane Scotto (Salle Mohamed Ali Nimes) surrender in 2nd round. Thanks to Dominique Siegler for this video. See the dress (black&white) with short sleeves. Very nice. Ju-jitsu and savate were teached hand in hand in old days. But the author of this clip didn't want to mention it. But all in all we can see brilliant retrospection through black and white eyes. Olivier de Dupuis and Zsolt Sandor demonstrated La Canne on Dreynevent 2008. Hungarian - French teachers connection. ASSP savate club from Paris, France shows us great savate duel. Gordon Brown British Prime Minister meets British Olympic Boxing Team. English boxing is recognised in GB as traditional "gentleman" sport. Did French Prime Minister ever met French Savate team? Do you have some information about French national sport "French boxing" SAVATE in connection with goverment public-relations? Legend of UFC 1, and K1 Gerard Gordeau was a competitor in French boxing - Boxe Francaise - SAVATE. Netherland is his homeland, and in 1991 he represented savate for his country. In Netherland savate team were also Mark Holland, Fred Royers, Ernesto Hoost. Oh yes Gerard is the man who finishes the last action in this video. 9 times Champion of France, 4 times Champion of Europe, 2 times Champion of the world, 4 times winner of Cup France and 5 times owner of Golden Katana (the best boxer of all categories). 92 combats, 89 victories (43 K.O) et 3 losses, in French boxing - Boxe-Francaise-Savate. 3 times champion of the world in Kick-Boxing. Savate is sport for smart and educated people, and James Southwood gives us a good example. 00:45 speaks for itself. See double chasse (piston kick)in opponent lead leg and second chasse is just a feint (trajectorie) and in a second it transforms in fouette (roundhouse kick) in a head. Slow brains cannot produce such an intelligent action, for sure. Train hard and think hard. Did you know that Robert Paturel was former savate - boxe francaise combat champion? You can see him here in savate defense actions done by ADAC and RAID methods. 00:38 is the time when one of the fighters (blue) fell down on his knees KO, and the other (black) punched him in the head. Judges were strict. Disqualification of the black. Savate sport differs from country to country. Savate is not about the techniques... It is philosophy of fighting it is strategy and fineness of movement. There are many fighters who step in savate ring but only few of them are real savateurs. And remember this - savate is not when you fight under savate rules. GB7 Marseilles. Shin kicks allowed - is motto of new born discipline in savate. Like professional sport - this discipline will be more attractive than all other bare foot sorts of kickboxing. Shoes are advantage in fight and martial art world will find out what these words mean very soon. Nice part of savate training called savate forme. Like tae-bo but performed with more boxing and kicking techniques. Music? Of course, don't forget it. This is part 4 and we expect more, more and more. From 1908 to 2008 Genova italian school of savate uses the same sport techniques, chasse - croise like later Bruce Lee did. I think that this Italian school is one of the oldest in Italy although there are several Golden gloves like Manusardi, Mameli, ... Remember great fighter Nocentini who fought Panza, Paturel, May, and many others. Hungarian TEAM in their gym in Budapest. Well equiped and highly motivated they prepare competitors for combat and assaut matches. You can find them on http://www.savate.hu and ask them about their interview you see below. Gre za univerzitetni klub Caen v katerem trenira temnopolti Gédéon KABRE Saint-Aignan-de-Cramesnil, Basse-Normandie v Franciji. Zanimivi "tajmingi" rušenja in čiščenja, ki jih špe nisem vajen oziroma jih sam verjetno ne bi uporabljal. Vsak dan se učimo naprej. Za strašljivo uničujočo tehniko rdečega škorpijona Ignashova ste verjetno že slišali v K1. Zagotovo pa še niste slišali za fanta Gregorya Tonya, ki z Alexejem dobesedno pomete. No zgodba je podobna Khiderjevi, pa vseeno, verjemite v medijsko pojavnost , verjemite da obstaja le en svet in pohvale Slončku in trpežnemu sadežu ki sta razmajala ponosno slovensko dogmo do materne na Viktorjih. Naj me pes poščije in se mi golob v glavo zaleti če ne bo to postala v kratkem ena bolj razpoznavnih vadb s palico v naših krajih. Seveda pa se računa tudi na širitev preko meja. Kickboxing superstar 2006 - Emerik Veceric vs. Angelo Valente. Emerik Veceric is Croatian ASSAUT savate national coach. Nenanbrušeno rezilo lomi kosti in celo seka za šalo kot vidimo s posnetka. Kaj je vztrajnost, kaj ostrina in kaj pospešek se sprašujem tudi sam. Nicole Sedmak, ki baje nima slovenskih korenin kot mi je zatrdila, prikazuje lokalnemu Jonasu Ž kako se približno trenira savate. No in ker je reklama dobro spremljana je efekt dosežen. Moring bi hotel biti drugačen od Capoeire. Hoče biti bolj tekmovalen. To mu lahko uspe samo s praktičnim preizkusom, ki bo deloval. In mislim da je na dobri poti. Talno borjenje gre naprej. Super. This Saturday, 1st March 2008, in China, the Executive Committee of FISU unanimously accepted the candidacy of Savate. Alexander WALNIER presented the file to 26 members of the Executive Committee of FISU on behalf of the International Federation of Savate. The 1st World University Championship will be organized in Nantes in June 2010. A big step forward for our sport! "The two photos speak for themselves, at the Executive Committee of the International Federation of University Sport (FISU), he has presented an excellent case for the candidature of the city of Nantes (France) to organize the first official World University Championship of Savate in 2010. From this day, Savate is an official sport of FISU! Thank you Alexandre, you were the brilliant final voice of a file that testifies to what we can achieve together. - To Alexandre Walnier who understood, from the first days, the importance of this candidature, for his contacts with the people able to help us with the recognition of Savate within FISU, for his work representing Savate in China and for the quality of presentation of the file, for his love of Savate. On behalf of all Savateurs, thank you to everyone, and thank you Alexandre for this success. We won a first victory, because this was the result of the work of a lot of people, we should understand that we will only gain by working all together, for there are other candidatures (on which we already work) awaiting us: The African games, the Mediterranean Games, the games of the french-speaking world, the Asian games, and especially on the file that is my principal objective: the recognition of Savate within AGFIS. Savate deserves recognition within the international athletic movement! FISU have given it to us! It was with much emotion that I welcomed this news, more than my victories in combat in my youth, for I know that I share this victory with many Savateurs around the world." Neodločni sodnik lahko omogoči slabšemu tekmovalcu prednost in celo zmago. V tem primeru se tekmovalec v črnem dresu zaganja in dela premočno živčno tehniko. Ker sodnik ne uporabi zagroženih opominov in minus točk, razbije drugemu tekmovalcu motiv in ritem v borbi. Na tak način odstopanje od enotnih pravil v lahkem kontaktu izkoristi borec v črnem dresu in niza točke nepravilnih in premočnih tehnik, saj izkorišča omahljivost sodnika. Dogovor je pač lahki kontakt, ki pa se ga eden izmed tekmovalcev ne drži. Taka borba se kasneje sprevrže v cirkus ki nima ne repa ne glave in kaj hitro se zgod da se izrodi na tak način celo tekmovanje. Že videno. Vrhunski francoski polnokontaktni combat borci znajo brcati izjemno dobro. In ne sanjajo o nobenih drugih kompenzacijah z ostalimi tehnikami. Brcanje je prvo saj prinaša 4 krat več točk kot udarjanje z rokami. Seveda pa je kombinacija ročne in nožne tehnike izjemnega pomena. Djibrine Fall Télémaque in Ismaila Sarr(popravek od Janeza in Tine :) ) prikazujeta hitre in tekoče nožne brce, visoke večkratne brce v skoku, obratu, skratka vse kar si lahko izmislite na temo brcanja. In to je recept za dobrega trenerja in borca. Savate - francoski boks je znan po svoji raznovrstnosti in ocenjevanju le te na tekmi assaut. Zakaj potem hudiča tudi combat borci nadvse odlično brcajo z nogami vse te nepotrebne tehnike? Zelo zanimiva italijanska savate šola (Genova), kjer so se pojavili prvi uspešni italijanski mednarodni borci se v marsičem razlikuje od ostalih (Milano, Rim...). Uporabljajo vse značilne prvine savate športa - pravi timing, namesto površinske brce uporabi kratek impulz, tekoča tehnika, mirnost v borbi in značilno igrivost. In to je recept za uspešen Mameli savate. Zelo tekoča in fluidna tehnika, ki ji bomo v UKBV kmalu kos. Zanimivi elementi v pravem timingu, ki jih znanec Smael (skupaj sva bila na seminarju v Franciji) prikazuje. Letos bo v Nemčiji potekalo SP v Canne de Combatu. Napovedujejo največje SP doslej. Želja je združiti Canne in Francoski boks disciplino na enotnem SP, kar bi še povečalo atraktivnost prireditve.